This modern wood accent wall tutorial will show you exactly how to install a wood wall in your bedroom. Copy this fun pattern to create a big impact with a small budget! A modern wood accent wall can add instant character to an otherwise boring room. Whether you finish it with stain or paint, a wood wall can bring so much warmth and interest to any space. 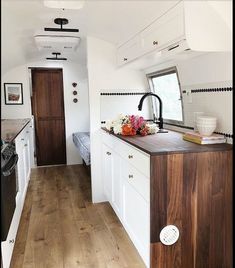 When coming up with a design for our RV bedroom, I knew I wanted a fun wood wall but decided to switch it up from the basic horizontal planks. I came up with the geometric design and my handy husband, Mike, got right to work bringing it to life. Below is the exact tutorial for how we created this modern wood wall. We chose to install ¾” OSB Plywood behind the wood wall. This thick plywood made a strong backer to nail the thin 1” x 2” boards into. 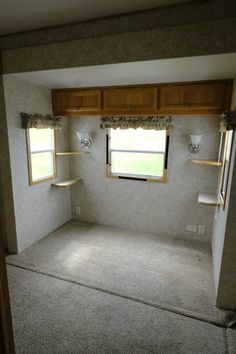 It also eliminated the need to fasten all of the small individual boards into studs. To prepare the plywood, it needed to be cut down to size and have holes drilled for the electrical wires for wall lamps. The electrical wires were already in place since removing the original built-in lamps. 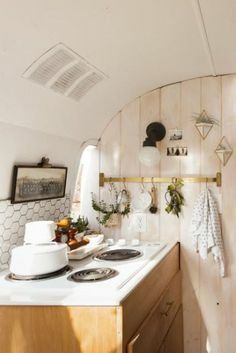 This made it super easy to reuse the electrical wires, and upgrade the light fixtures! To install the OSB Plywood backer board, we used 3″ framing nails and a nail gun to fasten the plywood to the studs in the wall. This is the stud finder we used to easily locate the studs. To get started on the pattern for this modern wood accent wall, we marked the plywood with guide-lines. These guide-lines served as markers for the ever-so-important first few boards. The placement and the cuts of the first few boards help to to keep everything perfectly symmetrical; if they are off by a few degrees, it will cause problems later in the project. We used a tape measure to find the center of the plywood, and then used a pencil to make vertical and horizontal lines. These lines formed a large “+” that spanned across the entire wall. Next, we marked out 45 degree diagonal lines, which formed an “X” that also spanned across the whole wall. 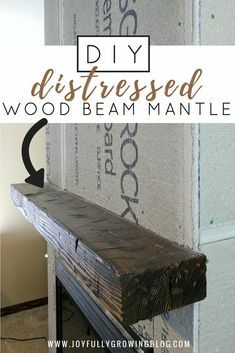 Related: How To Create A Distressed Wood Beam Mantel For Cheap! Our wood wall is made from over 100 individually cut 1” x 2” boards. All the small boards had to be cut with exact angles and lengths so they would fit tightly together like a gigantic precise puzzle. To make accurate cuts, we used our miter saw with a fine finish trim blade. We used a router with a ¼” round over bit on every board to make the pattern more visible, and to give everything a professionally finished look. But guys, this took FOREVER! All four sides of every single 1” x 2” board… that’s 116 boards with 4 sides = 464 routered edges! Although time consuming, I’m glad we chose to router the edges because it turned out amazing! To fasten the 1” x 2” boards to the plywood backer, we used a 18 gauge trim nail gun and 1.5” nails. The very first board we nailed up spanned across the whole wall on one of the 45 degree guide-lines that we marked earlier. This board needed to be measured to length, and then cut with opposing 45 degree angle cuts on either side. Next, we filled in the rest of the “X” pattern with one board pointing to 2 o’clock, and another board pointing to 8 o’clock. Both boards needed to be straight-cut in the middle, and then 45 degree angle cut on the outsides. Again, we carefully placed the boards onto the guide-lines, and then nailed them in place. Once the initial “X” boards were in place, things got a little easier and quicker. We started working out from the middle to fill in the rest of the modern wood accent wall. The rest of the boards all have 45 degree angle cuts on both ends – which made all the cuts pretty simple. So at this point, it was just a matter of measuring for length and figuring out which direction to cut each end angle. Once the top and the bottom quadrants were completely filled in, we started working our way out towards both of the sides. The outer corners where the ceiling meets the wall were a little tricky. The boards needed to come to a point to fill in the 90 degree angle. Luckily, the miter saw made these intricate cuts pretty easy. When we were done with all the boards, there were small gaps left at the outer edges of the “+” shape (at 12, 3, 6, and 9 o’clock). The remaining gaps were triangle shape, and too small to fit full boards. The little triangles were difficult to cut because they were so small. We had to use a wood clamp to keep fingers away from the blade! The whole process took several hours, spread out over a few days. But once we finally got all the boards installed, it was time for stain. I really wanted the warmth of the wood tones to remain in this space so I decided to finish the design by applying Minwax wood stain in Early American. Once the stain was dry we sealed it with clear poly and it was finished! I hope this tutorial was helpful and gave you the confidence to DIY your own modern wood accent wall! 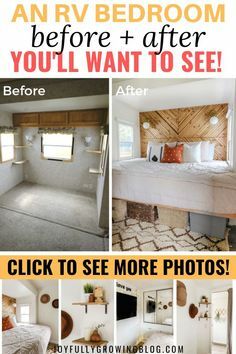 You can see the full room reveal featuring our DIY wood wall in this post. For more DIY tutorials, head here. Have you tried a DIY wood accent wall before? I’d love to hear all about your project in the comments below! Previous Post: « We’re Having A Baby!